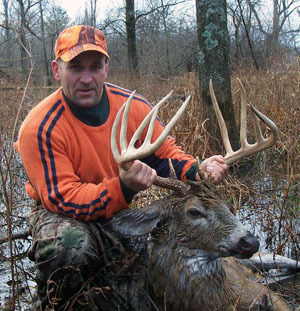 The 2010 upstate New York deer hunting season started as usual, lots of rain, wind and snow, not necessarily in that order. Very unpredictable winds for sure. My best friend, and father-in-law Ed , commented everyday on the darn wind and how it was screwing with our plans. But, we stayed the course and did our best to roll with mother nature. The wind, at times, sure made me second guess what the heck I was doing out here and gave my climber a good test. Despite the lousy conditions Ed and I kept hunting, knowing we would eventually zero in on what the deer were doing and try to re-position ourselves a little better. Finally, after mixing it up a bit with different locations, I spotted a few bucks one morning. One just towered over the others around him. I got a quick glimpse of his antlers which I felt were odd as they seemed to go straight upward about ten inches in the air not outward. I kept telling Ed, "Wait til you see this deer. I have NEVER seen one this majestic looking in my life." Im sure he didn't believe me at that moment, but I knew we would take the needed steps to keep a safe distance from the deer's comfort zone and not spook him. We decided to move a couple of climbers that morning trying to possibly get another quick glance at the buck. Surprisingly, I did end up getting within shooting range of the monster buck. But, there were too many small twigs and brush between us, so i passed up the shot and got out of there quickly so as not to let him know we were moving in on him. Finally the following day around 8:00 am, the day after Thanksgiving, I spotted the doe that this big buck has been hanging around with the last few days. She came very close to winding me and I feared the game might be over fast. My luck changed as the doe moved a bit further upwind and kept coming closer, but no buck behind her yet. I kept saying, "Come on. Come on." I knew he was back there behind her somewhere, but before she had been just 5-15 feet in front of him and now she was about 75 feet ahead. This gave me a second to quickly turn a bit so I could get a more comfortable shot if he appeared. The quick adjustment proved to be the right move. As I moved about 30 degrees to my right, I had spotted his bright shiny tall antlers. I said to myself, "Oh my gosh! Look at that deer." This oportunity was likely never going to present itself again being 75 yards from me and totally broadside. I pulled up my Remington 1100 and I quickly noticed he spotted me in the tree. I felt I was busted for sure, so i adjusted my sight just slightly lower and took him. My buddy Tim was a life saver for sure helping me get that brute out of the two feet of cold water and then finally out of the Pompey Valley. Mike's Onondaga County 13-point monster is being mounted by Bob Shepard of Bridgeport, NY and green scored 149-7 B&C making it eligible for the New York State Record Book.